Sergius wants you to pick-up an item from a client for enchanting. Sergius Turrianus in his room at the College of Winterhold. Talk to Sergius Turrianus in the College of Winterhold. Collect the item he wants. Sergius will request that you pickup an item to be enchanted from a customer, located somewhere in Skyrim. 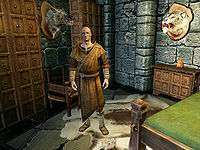 The NPC will be in a city (but not in the jail), will have a non-unique voice, and won't be part of either the Thalmor or the College of Winterhold; most of the possible NPCs are elves, but not all. In total, there are 57 possible NPCs. Locate the NPC and speak with them to obtain the item required. Return to Sergius to complete the quest and be rewarded. You will be rewarded with a leveled amount of gold for the delivery of the item. After the Thieves Guild quest Hard Answers, Aicantar will stay in Calcelmo's Tower and not leave. The dialogue option to accept the item from him is not available. If you try and pickpocket him, he is not carrying the item. He is immediately hostile towards you, and you will receive a bounty in Markarth as a guard will come to your location. Attacking and killing Aicantar fails the mini-quest, but worse, loses a merchant with Master Trader benefits as well as high level spells to sell. After killing Aicantar and returning to Sergius Turrianus you can continue to receive his radiant quests as normal. It is possible for Aicantar to randomly return to his original routine in Understone Keep after completing Hard Answers when receiving this quest; if this happens, receiving the Enchantment Pick-Up quest can force him to remain there for the duration of the game, or simply reappear at Calcemo's Tower. You may be directed to an NPC who is already dead (i.e. killed by a vampire if you have Dawnguard add-on installed), making the quest impossible to be completed. 10 Sergius Turrianus needs an item picked up from <Alias.ShortName=Client> in <Alias=ClientLocation> and returned to him so that he can enchant it. 20 I've received the item from <Alias.ShortName=Client> and need to deliver it to Sergius at the College so he can enchant it. 200 Finishes quest I've finished the task that Sergius gave me, and have successfully picked up and delivered the item from <Alias.ShortName=Client> so that it can be enchanted. The following empty quest stages were omitted from the table: 300. On the PC, it is possible to use the console to advance through the quest by entering setstage MGR10 stage, where stage is the number of the stage you wish to complete. It is not possible to un-complete (i.e. go back) quest stages, but it is possible to clear all stages of the quest using resetquest MGR10. This page was last modified on 24 March 2017, at 03:07.